HAVE YOU CHECKED YOUR PULSE? Introducing Pulse, your guide to predicting NCLEX success and tracking your progress. The NCLEX may seem like a long time from today. And you’re busy enough mastering your pharmacology course and powering through your Fundamentals course, or maybe Adult Medical-Surgical. But the NCLEX will be here sooner than you think, and it’s never too early to begin tracking your progress toward NCLEX success. That’s where Pulse comes in. Pulse uses an algorithm powered by the data of more than 76,000 nursing student who have come before you. The insights gleaned from their performance in nursing school can tell you whether you’re on track for NCLEX success, need improvement, or are at-risk. And you can get this information at-a-glance every time you log in to your account. You’ll find this readout on your Home page, below your calendar. Your performance on your Content Mastery Series proctored exams feed the algorithm that calculates your probability of NCLEX success. Pulse re-calculates your NCLEX readiness after each ATI proctored exam, so you won’t see day-to-day movement on your NCLEX dial. If you want to see day-to-day and week-to-week progress, keep reading. You will also begin to see new graphic readouts that report your use of individual products. Overall Usage vs Recommended Usage: This metric is an aggregation of the time you’ve spent working in the tutorials and the number of practice questions answered. It’s a good place to start, then you can dig deeper. 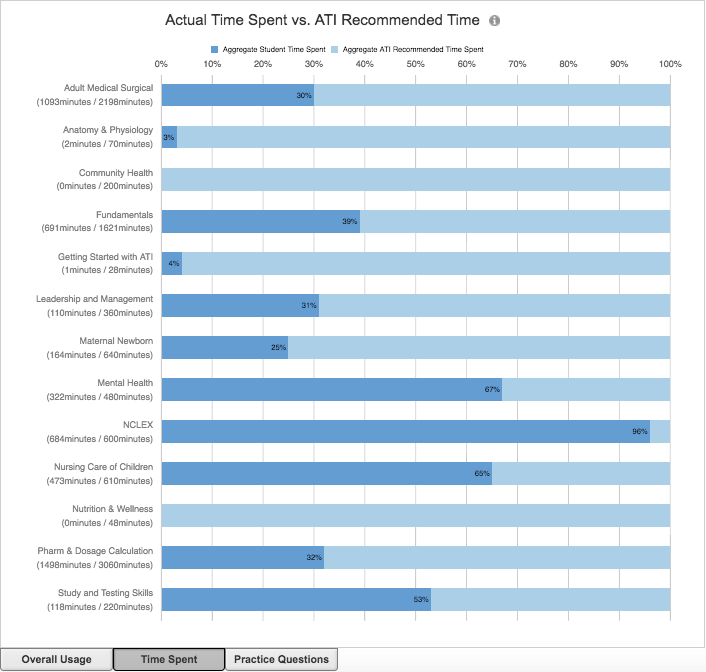 Actual Time Spent vs Recommended Time: This readout shows how many minutes you’ve spent working in your ATI tutorials against the time ATI recommends you spend in the tutorials. 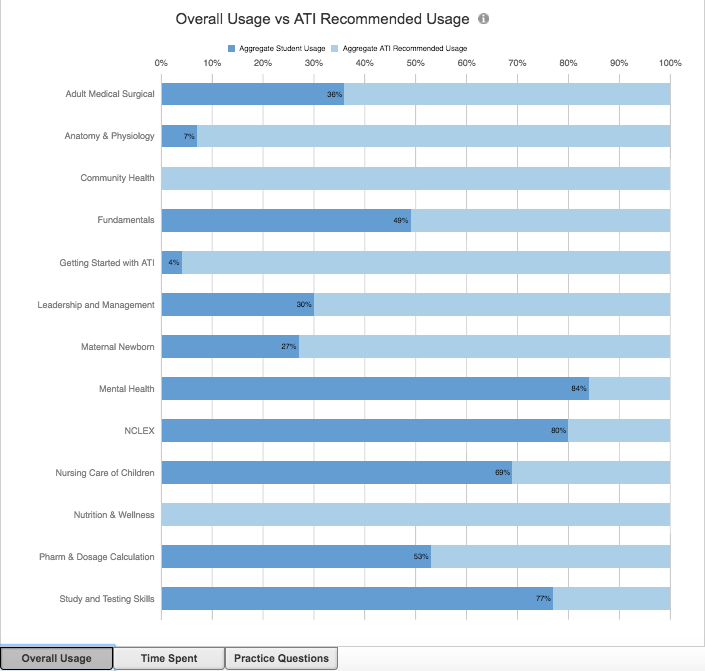 Practice Questions Answered: You have access to hundreds of practice questions in the ATI portal. This shows you how many you’ve answered and how many are still available for you to answer. You can drill down to more specific usage information by selecting a content area like Fundamentals or Pharmacology, and review your usage by product, module, practice test, and quiz. Some of you will have access to these tools in the next several weeks, while others might not see this feature until next semester, but we want to introduce you to Pulse now. We hope it’s a useful tool for you during your nursing school career and drives you to NCLEX success!